PLEASE NOTE that the Holders Season festival has been discontinued. 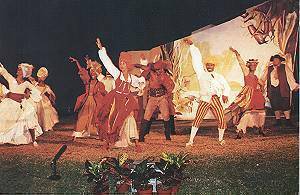 Founded in 1993, the Holders Season is established as the premier cultural event in the Caribbean. Acclaimed nationally and internationally, the season is a celebration of opera, music and theatre. The production always plays to capacity houses and its high artistic standard draws audiences from around the world. Holders House, St. James, again plays host to this musical and theatrical festival. This stately house has been in existence for over 300 years and is an interesting mixture of English and Barbadian vernacular. The grounds are extensive and lovely with mature tropical trees and shrubs, the perfect setting for the open-air theatre that comes alive every year during the Holders Season.